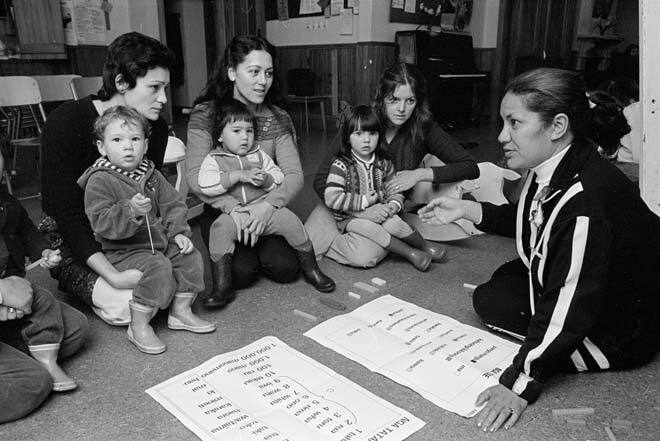 Billie Tait-Jones of Ngāi Tūhoe teaches te reo Māori to mothers and their children in 1981 using the rākau method, at Crossways community centre in Wellington. From left to right are Maria Brocherie and Shane (2), Sue Mihaere and Petera (2), Lorraine Hoff and Rachel (3), and Billie Tait-Jones. The rākau method uses coloured plastic Cuisenaire rods to teach language. Based on the 'Silent Way' teaching methodology, it was adapted for teaching Māori by Kāterina Mataira.